Offering extensive web services for as low as $4/month, Arvixe will attract a lot of customers based on its pricing alone. However, many people will want to stay with Arvixe for its unlimited disk space and data transfer, which means that you can build whatever sized site you want to without having to worry about hitting any monthly limits. You’ll also get a free domain name for life so long as you stay with Arvixe, proving the company’s dedication to its customers. With a choice between RVSiteBuilder, Softaculous script installer and an HTML editor, you’ll have the option to build your website however you’re most comfortable. Clearly, from their special promotions and valuable offerings, the company really brings you what they call the “Arvixe advantage”: the advantage of working with the best. For PersonalClass plans, Arvixe charges incredibly low rates on a monthly basis for all of these basic Linux hosting plans. Arvixe also has BusinessClass options, which expand your services so that your business has the support it needs. For even more dedicated server space, you could decide to go with VPSClass or DedicatedClass, which will give you progressively more reliability as you go. VPSClass lets you have the same space always dedicated to your website, which starts at $20/month. DedicatedClass, as its name implies, will give you an entire server to run your site on for as little as $429/month. Arvixe also offers ResellerClass packages to help you get your own hosting company started ASAP. This program starts as low as $20/month per client, allowing you to potentially recoup the cost of services by charging webmaster fees. For all of these options, Arvixe also offers Windows hosting options, in case you prefer working with an ASP.NET interface. In general, these features will add a dollar or more to the monthly cost of each package, depending on what type of hosting you’re seeking. There are also a few add on services, which can definitely be helpful depending on the type of website you’re trying to run. The most helpful of these is an SSL certificate, which can make money transactions on your site more secure for $25/year. As we mentioned at the onset, Arvixe doesn’t skimp on its features just because it has economy pricing. Quite the opposite is true, allowing you to host multiple domains with even the most basic package, as well as giving you unlimited storage and transfer. If you’re interested in BusinessClass, ResellerClass, VPSClass or DedicatedClass, be sure to visit Arvixe today and see even more features available on these expanded offerings. To see just how simple and accommodating Arvixe was, we decided to build a site by launching the RVSiteBuilder software from the included cPanel demo. The site set up was very simple, requiring only a few clickable actions to be taken to the cPanel from the check out, and it seemed that using Arvixe’s site building solution could be just as easy. The site building, for the most part functioned smoothly. Unfortunately, the RVSiteBuilder is a little bit clunky, making for an inelegant solution for people that are new to webhosting. Mostly, it just takes a while playing with the editing tools to get what you are looking for from the site builder interface. If you play with these features enough, though, you should be able to find the results you want. Less experienced web builders who are more interested in designing a site than they are in developing their content should know that Arvixe does come ready to run the Softaculous script installer right out of the gate. This way, instead of messing with a lot of presets, you can just install a simple content management system and get ready to go. Joomla, Drupal, WordPress, OpenCart and phpBB will all be just a couple clicks away whenever you’re ready. 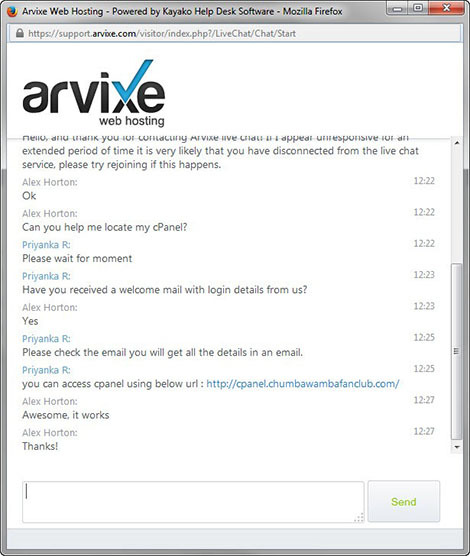 Offering chat, email and telephone support, Arvixe has definitely taken pains to make sure that its customers can reach out in any way that they want. Additionally, the response times for all these services were much faster than many competing services can match. Starting with chat, we posed a test question for the customer service to respond to, which was resolved within 5 minutes. Phone support, though slightly less expedient, was similarly impressive when compared to other services telephone assistance, resolving our issue in less than a half hour. Even the email service was impressive, taking only an hour to respond with a thoroughly helpful answer.